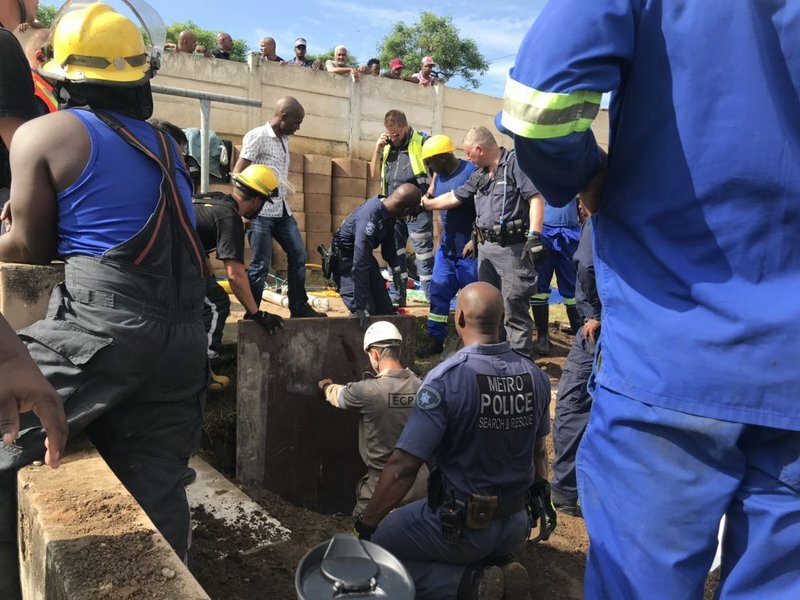 A newborn baby girl who was stuck in a storm water drain in Newlands East for several hours has been pulled out alive. The men and women from Durban’s emergency services have been working for nearly three hours to save the infant. The eThekwini Metro Police's Search and Rescue Unit, along with the Durban Fire Department and Rescue Care medics, raced to a home in the area, north of Durban this morning after receiving reports that a passerby had heard the infant's cries from a storm water drain along Baracuda Road. Emergency services quickly descended on the scene and following a lengthy operation, which saw them dig down to the pipe, cut it open and pull the baby out, managed to rescue her. The child was stuck more than seven metres down the pipe -- but was still crying and moving. There were loud cheers from locals who had gathered at the scene when a firefighter pulled the baby out of the pipe and passed her to waiting paramedics. The infant was crying, but appeared to be in good health. She was quickly rushed to a waiting helicopter and will be flown to a nearby hospital.